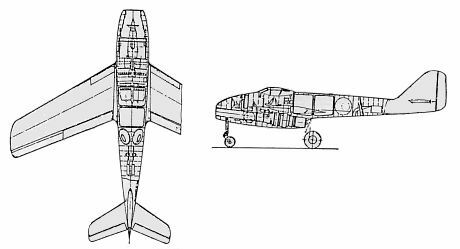 This Focke-Wulf design (also known as Design III) for a twin-jet nightfighter dates from March 19, 1945. It was to be constructed entirely of Duraluminum. The wings were mounted mid-fuselage and were swept back 30 degrees. Two He S 011 turbojets were located beneath the cockpit side-by-side. This arrangement permitted one engine to be shut down to conserve fuel without an undue slewing around the vertical axis. A crew of three (pilot, radio operator and navigator) sat in a pressurized cockpit, with the pilot and navigator sitting side-by-side and the radio operator sitting behind them and facing to the rear. Projected armament consisted of two MK 108 30mm cannon in the fuselage nose and two MK 108 30mm cannon firing upwards in the rear fuselage, or four MK 108 30mm cannon firing forward in the fuselage nose. 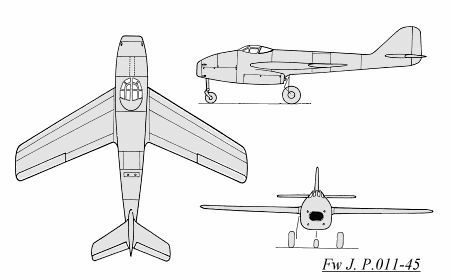 Although this design did not materialize for Germany, the aircraft was built as the MIG I-320 by the U.S.S.R. and made its first flight in April 1949.